This is the belated Valentine chocolate cake I made for my husband following on from the last blog of strawberry heart cookies. It is a Rachel Manley recipe and boy is it goooood! 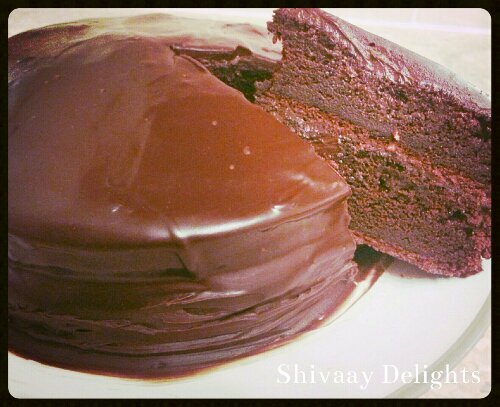 So moist, fudgy, decadent, divine…I could keep going on but why not try baking it and seeing for yourself. Please let me know what you think. A quick note when it states 250 ml boiling water don’t be alarmed this is the part of the recipe that really makes this fudge cake special once made! Enjoy with a little single cream, yummmmm!!! 3. Slowly add the boiling water to the mixture until smooth. The cake mixture will now be very liquid! This chocolate cake looks delicious! OMG this cake!! It looks soooo delicious – you can so how moist and rich it is! Thank you! I must admit it was delicious! Everyone that had a piece loved it! Thank you! That’s so sweet of you 🙂 I’m glad you all enjoyed it! Aww thank you 🙂 the ganache was to die for even though I say so myself! If I don’t have two tins. How do i go about it. Hi shivaay , thanks for the recepe .. I don’t use eggs , is there an alternate you can suggest .. I dont have an oven…can i use a microwave to bake?If yes then what should be the temp?and time? I haven’t used a microwave to bake ever…Sorry!